It is the fact that pulsars are such accurate clocks that have made them such valuable tools with which to test Einstein’s theory. In the ‘binary pulsar’ system discovered by Taylor and Hulse, a 1.4 solar mass pulsar is orbiting a companion star of equal mass. It thus comprises two co-rotating stellar mass objects. 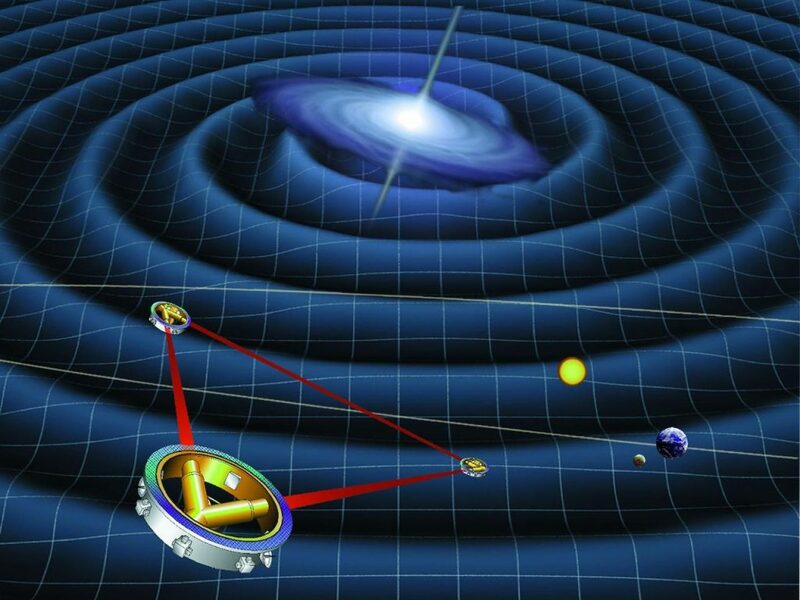 General Relativity predicts that such a system will radiate gravitational waves – ripples in space-time that propagate out through the Universe at the speed of light. Though gravitational wave detectors are now in operation across the globe, this gravitational radiation is far too weak to be directly detected. But there is a consequent effect that can be detected. As the binary system is losing energy as the result of its gravitational radiation, the two stars should gradually spiral in towards each other. The fact that one of these objects is a pulsar allows us to very precisely determine the orbital parameters of the system. Precise observations over the 40 years since it was first discovered show how the two bodies are slowly spiralling in towards each other, exactly agreeing with Einstein’s predictions! Taylor and Hulse received the Nobel Prize for Physics in 1993 for this outstanding work. It is another pulsar system, this time where both objects in the system are pulsars, and called the ‘Double Pulsar’, that has produced some of the most stringent test of General Relativity to date. 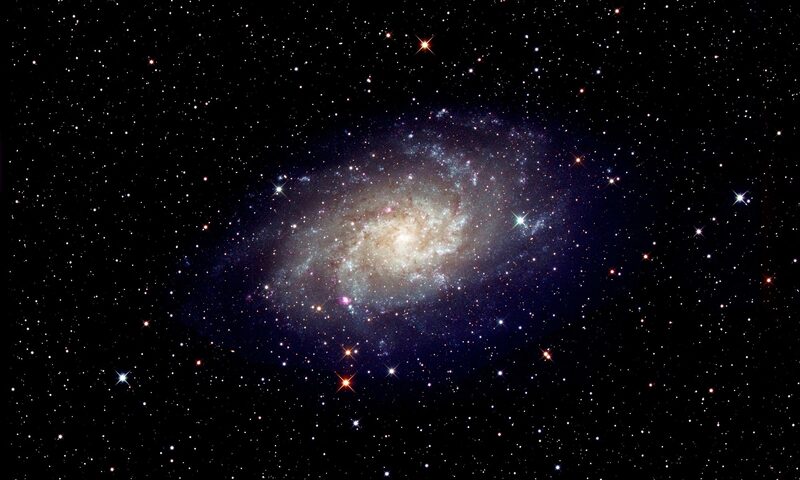 It was discovered in a survey carried out at the Parkes Telescope in Australia using receivers and data acquisition equipment built at the University of Manchester’s Jodrell Bank Observatory. In analysis of the resulting data using a super-computer at Jodrell Bank the double pulsar was discovered in 2003. It comprises two pulsars of masses 1.25 and 1.34 solar masses spinning with rotation rates of 2.8 seconds and 23 milliseconds respectively. They orbit each other every 2.4 hours with an orbital major axis just less than the diameter of the Sun. The neutron stars are moving at speeds of 0.01% that of light and it is thus a system in which the effects of general relativity are more apparent than any other known system. At this moment in time, General Relativity predicts that the two neutron stars should be spiralling in towards each other at a rate of 7 mm per day. Observations made across the world since then, including those using the Lovell Telescope at Jodrell Bank, have show this to be exactly as predicted. As the two neutron stars at gradually getting closer, at some point in the future they will coalesce to form what may well be a black hole. As they finally merge into a powerful gravitational wave is produced. The predicted strength of the gravitational wave produced by such mergers is such that, before long, it is expected that they will be detected by gravitational wave detectors on Earth but, somewhat surprisingly, it is a further source of gravitational waves that were first detected in late 2015. 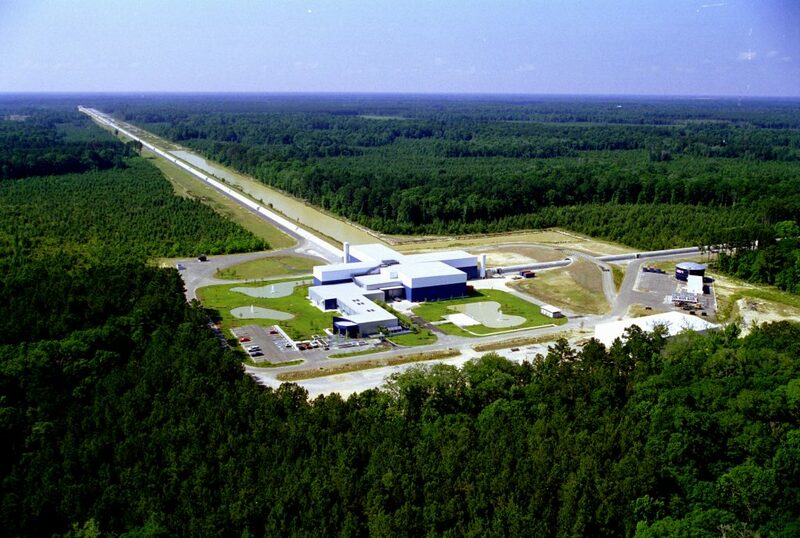 Two Gravitational Wave Observatories called ‘LIGO’ (Laser Interferometer Gravitational Wave Observatory) have been built in North America and came into operation in their ‘Advanced’ form in late 2015. 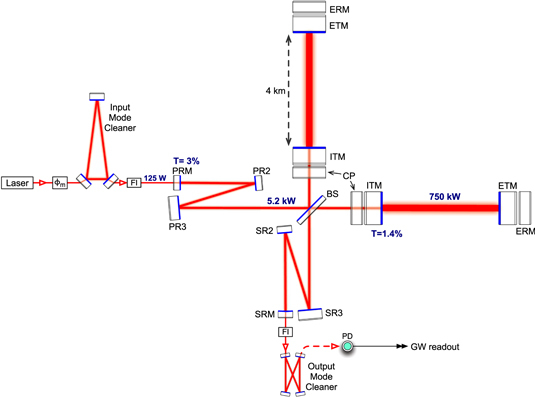 LIGO uses a device called a laser interferometer, which measures the time it takes light to travel between suspended mirrors to very high precision using laser light. Two mirrors, 4 kilometres apart, form one ‘arm’ of the interferometer, and two further mirrors make a second arm perpendicular to the first forming an L shape. Laser light enters the system at the corner of the L and a beam splitter divides the light between the arms. The laser light reflects back and forth between the mirrors repeatedly before it returns to the beam splitter. Any deviations in the path lengths, as would be caused by the passing of a gravitational wave, can be measured with extreme precision − movements as small as one thousandth the diameter of a proton can be measured! To achieve this, the mirrors and the light paths between them are housed in one of the world’s largest vacuum systems, with a volume of nearly 300,000 cubic feet, evacuated to a pressure of only one-trillionth of an atmosphere. High-precision, vibration-isolation systems are needed to shield the suspended mirrors must from natural vibrations such as those produced by earth tremors. Currently, there are two LIGO locations, one located at Hanford in Oregon and a second at Livingston in Louisiana to the south − a separation of 9 milliseconds in light travel time. 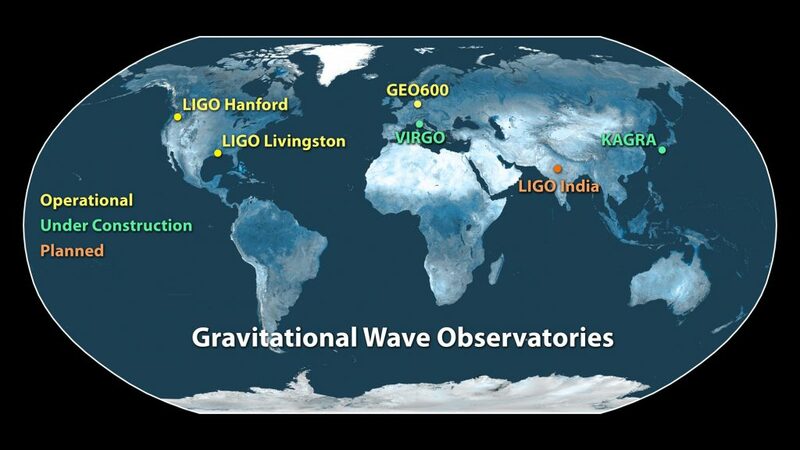 In the initial ‘LIGO’ observations, no gravitational wave events were detected. They then came off-line and their sensitivity was greatly enhanced to produce ‘Advanced LIGO’. The two observatories came back on-line and started observations in September 2015. In what will almost certainly be one of the most important discoveries of this century, both sites detected a gravitational wave on the 14th September. 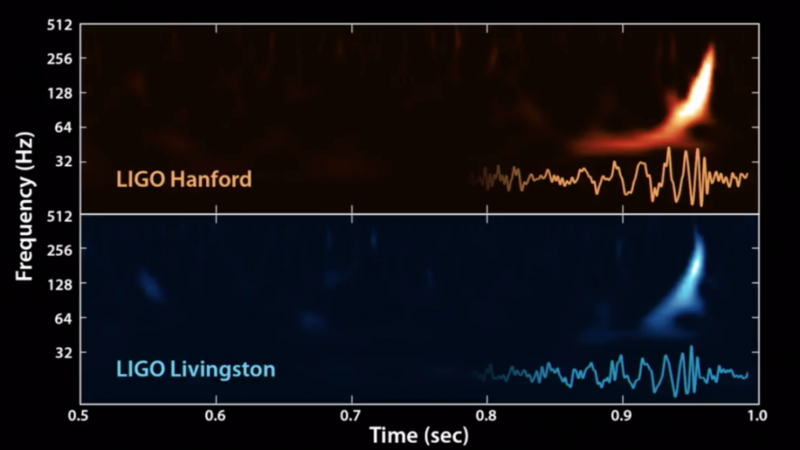 The ‘chirp’ waveforms, increasing in frequency as two massive black holes spiralled in towards each other, appeared identical at the two sites but were separated in time by 9 milliseconds, Livingston first. Not only does this provide superb corroboration of the truth of the signals, but also that the gravitational wave must have arrived from the south with the most probable location of the event being in the direction of the south celestial pole. From the precise shape and amplitude of the two waveforms, it was possible to deduce (in a way I find quite amazing) that the two detectors had observed the merger of two black holes of 29 and 36 solar masses to produce a single black hole of mass 62 solar masses. You will spot that 3 solar masses has been ‘lost’. 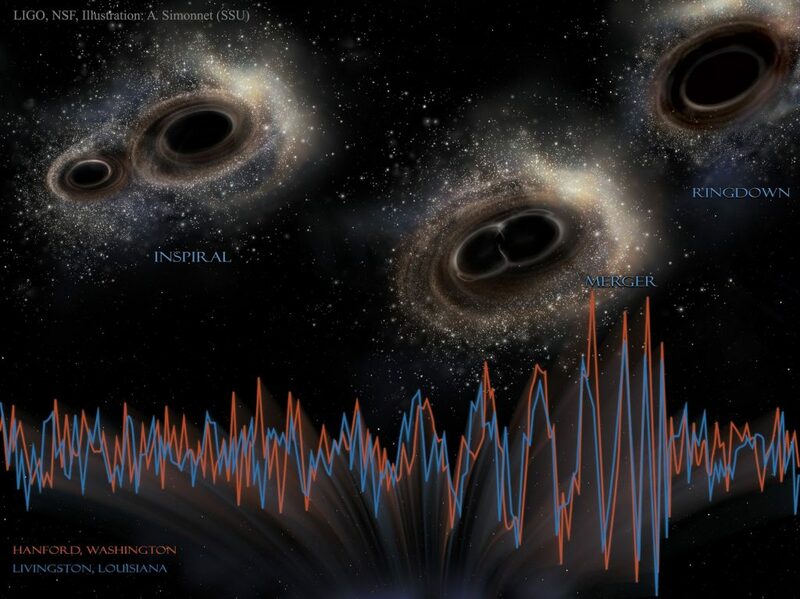 It is this mass that has been converted into the gravitational wave that was observed − the most energetic event that has ever been witnessed from Earth! From the amplitude and hence energy in the wave measured on Earth by Advanced LIGO, it was possible to deduce that the event happened at a distance of 1.3 Billion light years (+/- 500 Million light years). A candidate, but unconfirmed, event was observed on October 12th but then a confirmed event (GW151226), the merger of 14 and 8 solar mass black holes, was observed on December 26th, thought to be at a distance of ~1.4 billion light years. LIGO was able to observe 27 orbits over one second (as opposed to 2/10ths of a second for GW150914, the first detection). The observations agree perfectly with General Relativity and showed that one Black Hole is spinning. Following its first observing run, improvements to the system (such as increasing the laser power) will, over time, increase its sensitivity by a factor of two so enabling black hole mergers to be detected at greater distances and should also allow the merging of two neutron stars into a black hole to be observed. Further gravitational wave detectors are to come into operation: VIRGO and GEO600 in Europe, KAGRA in Japan and a further Advanced LIGO detector in India. When an event can be detected by several detectors, the time differences will allow far greater precision as to its direction so perhaps enabling optical telescopes to observe the galaxy system in which it occurred. A detector with ‘arms’ of length 5 million km, called e-LISA, is planned to be located in space and this year the ‘LISA Pathfinder’ satellite has proven many of the techniques that are needed. A new era in the study of our Universe has begun!